Exposed seawall near Pier 14 in San Francisco’s waterfront. Photo courtesy Port of San Francisco. Amsterdam and San Francisco — The Port of San Francisco selected CH2M in partnership with Arcadis to lead the design and engineering for the 10-year Seawall Resiliency Project. The total fee for the contract amounts to $40 million. In an approximately equal partnership, Arcadis and CH2M will jointly share management of the project. Arcadis will lead risk analysis, coastal engineering and modeling while CH2M will provide marine and structural engineering services for the seawall and other structures. 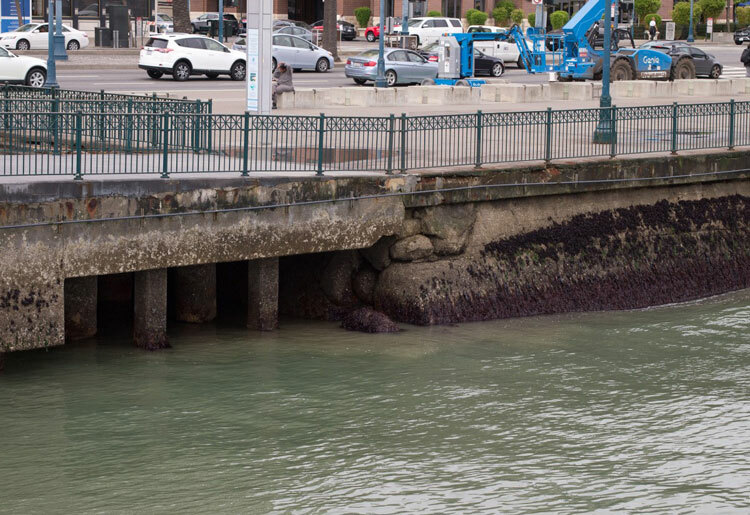 The aim of the San Francisco Seawall Resiliency Project is to fortify 3.5 miles of a century-old seawall protecting the city’s most treasured waterfront from Fisherman’s Wharf to Mission Creek near AT&T Park, home of the San Francisco Giants baseball team. The seawall supports historic piers, wharves, and buildings including the Ferry Building. It underpins the Embarcadero Promenade which welcomes millions of people each year and provides flood protection to San Francisco’s Financial District and other neighborhoods. The seawall also serves as a critical emergency response and recovery area, and it supports multiple municipal transportation systems and utility networks.